Hi girls, I'm back again! 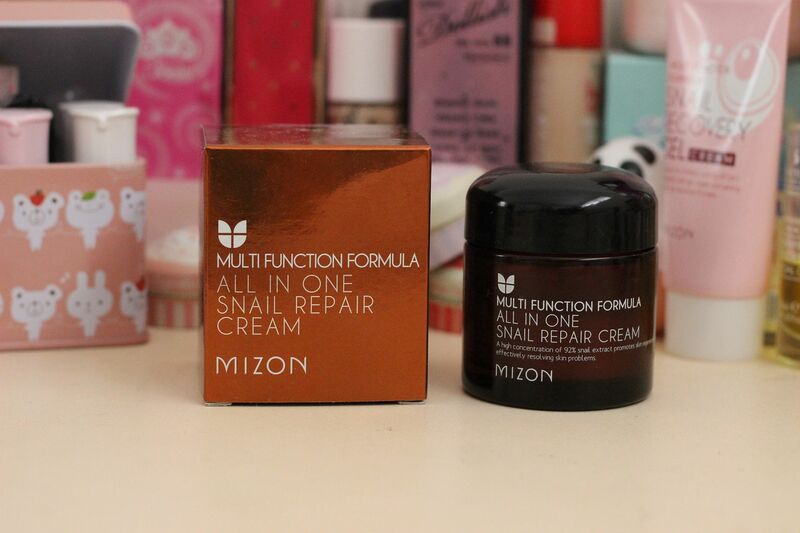 Yesterday I uploaded my review on the Snail Gel Cream from Mizon, and tonight I want to continue that with my thoughts on the All in One Repair Cream, which I've been using in conjunction with the gel (since they're from the same range, and recommended to be used together for best results). I mentioned in yesterday's post that I found the gel to work reasonably well on diminishing any small blemishes that want to pop up, but that I didn't necessarily find it to live up to all the hype from many other bloggers' reviews. That's how I felt about the gel when used on it's own - but since I've been using this as an accompaniment to the Repair Cream for the last 2.5 months, I have to say the results turned out a lot better. My skin's smoother, clearer, and I noticed a definite drop in the amount of blemishes I've been getting. I can hardly recall any major blemishes in the last two-ish months (minus the time my skin got bumpy from using the Olay Cleansing System). At about $20-25, the Repair Cream is almost three times the cost of the Gel, but it is bigger at 75 grams, and it does have a higher snail secretion content, at 92%. Just to add, the snails aren't harmed in order to get the secretion! Mizon also makes bigger claims of this repair cream - the higher concentration of snail secretion supposedly better targets strengthening and repairing damaged skin, reducing excessive sebum, managing large pores, filling wrinkles, reducing redness, hydrating skin, brightening skin tone, making skin more elastic, and soothing and protecting sensitive skin. I can't say I've noticed the cream doing all that for me, particularly since I don't have all the issues listed. I'll say what I like about this cream, and what I've noticed it doing for me. I like how light the texture is - it's not sticky, it's very thin in texture and applies to the skin very easily and smoothly. Despite its light texture, I find it's mostly hydrating enough for my dry-normal skin type. I still like to layer skincare though, so I usually use a face oil, this cream, and then the Gel cream on top for full hydration for my skin. When I'm really lazy, I do just use this cream only at night, and I won't wake up with dry or dehydrated skin the next day. It has a vaguely alcoholic scent, but for some reason I never noticed the scent until now, when I'm more than halfway through the tub. The scent has never been an issue for me though. I didn't notice any results right away - but I believe when it comes to skincare, sometimes you need to give it more than one or two weeks to see results. I felt like I started noticing an improvement about a month afterwards, but it's only now, nearly 3 months later, that I've realised just how good it's been to my skin. Just to add, I thought it was starting to break me out about 5 or 6 days after usage as I started to get a few small bumps, but they never came to head, and disappeared soon after. As mentioned, after 3 months, I feel like I've had less blemishes than I tended to get before starting using this skincare, and my skin does look and feel smoother now. I have to reiterate that it hasn't completely stopped all blemishes, particularly the nastier ones I get due to hormones, but I still feel like the amount of blemishes overall has decreased. I also feel like this has helped me immensely after my mishap with the Olay Cleansing System, where the daily exfoliation routine just sent my skin a little nuts! It seemed to soothe my troubled skin, and helped it recover faster than expected - I definitely think if I'd been using other skincare that the bumps on my chin and forehead would've been worse, or lingered longer otherwise. Has it made my skin more elastic and bouncy? I'm not too sure - but I feel like my skin's a little plumper now. It hasn't done much in terms of making my acne scars disappear, but I've noticed a decrease in the amount of redness on my cheeks. Nothing miraculous though! It's still a pleasing result, and definitely better results-wise than any other skincare I've used before. Overall I've definitely developed a huge love for this Repair Cream - if you're interested in the whole snail secretion thing, I'd recommend this moisturiser to you. I'd actually recommend you try this with the Gel for best results, but if I could only recommend one, I'd go for the Repair Cream as I think it delivered better results. Will I re-purchase? I already have. I'm 99% convinced that I want to stick with this as my permanent skincare, but shopaholic that I am, I do have another set of skincare I want to try first before going back to this...why am I so fickle, lol. You can also read my review on the Mizon Snail Recovery Gel here if you haven't already. great review :) it seems like snail secretion still a popular ingredient in skin cares. I would love to try this out, probably for my blemishes. Ahh! Thanks for sharing! I'm still too scared to use anything snail ;___; bahh i've been hearing how good the creams are thooo! Oooo snail goods! The cream looks really..light, like if you put a lot of on your skin, it'd absorb itself into the skin pretty quickly without leaving you feeling overhydrated. Glad the review was helpful! Thanks! Yep, I find it a bit bizarre - I wonder who's idea it was to use snail slime lol. Hehe, I hesitated a lot before getting this! Thankfully the cream doesn't resemble anything slimy! Any reason that..... My skin is very dry after I used this product. Is that normal? Hmm, that's strange, because I find it quite good for my dry-normal skin. I usually use a face oil before this so that helps my skin stay hydrated. I notice that this cream does have alcohol in it, but I don't think it's enough to cause dryness though! Haii.. I've been using the cream for a week... And i see some improvement on my face.. My acne healed... Only for a week.. And right now im waiting for the gel to safely landed on my table.. Im 100% will stick with this mizon snail..
Hi, sorry I don't know of anywhere it can be purchased in Australia at the moment. I buy all my korean skincare online since I've never seen Mizon products here before. I use this morning and night! Since my skin is a little dryer lately I use this first, then layer a richer cream over it to seal in all that snail goodness lol. I noticed a /definite/ improvement to my skin after a month, and even more after 2 months. I've just bought my 3rd jar! It's not a miracle cure all, but it's calmed my skin, smoothed it, and brightened it overall. Sorry for the late reply! So, whats better? All in one repair cream or recovery gel? Have you tried Bneton's products? I have the toner and I've been using it with the Mizon cream and recovery gel, but it wasn't nothing spectaculous. Tho the story changed when I began to use Bneton's snail bee high content essence it works lovely with the mizon products ♥ Now I'm all for snail products when it comes to my skin care routine. You can buy this line at lightinthebox.com which has free shipping to where I live!